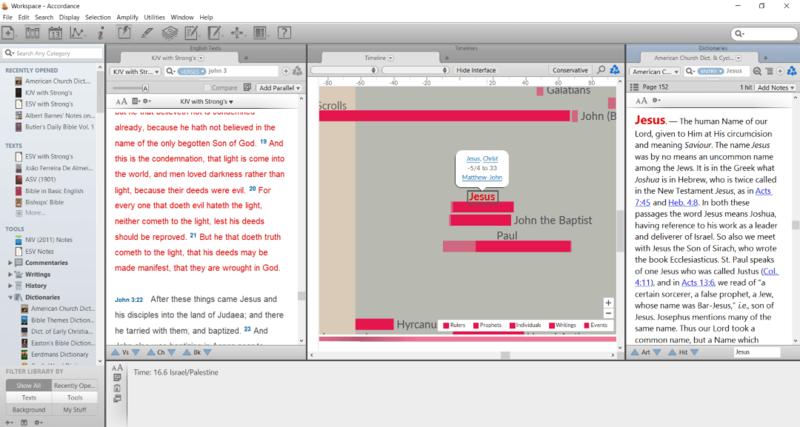 Accordance from OakTree is one of those Bible software packages that’s well-suited for a wide audience from beginner all the way to professional-level Bible study. It’s been around for many years on Apple products and version 10 was released on Windows. 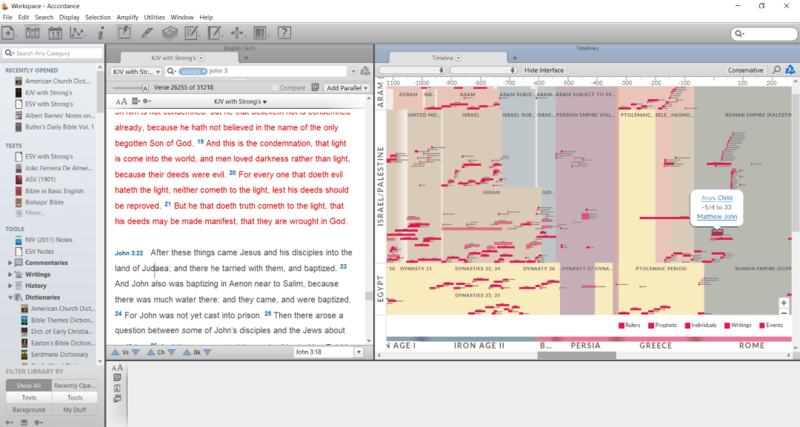 OakTree recently released Accordance 12, which raises the level and value even further. 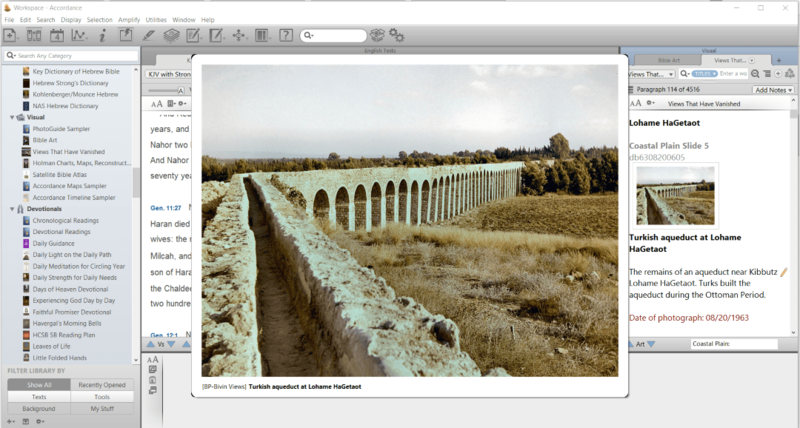 In this review I take a look at Accordance 12 for Windows. There are several packages available to suit all budgets and needs. I’m reviewing the English Discoverer and Graphics Learner collections. 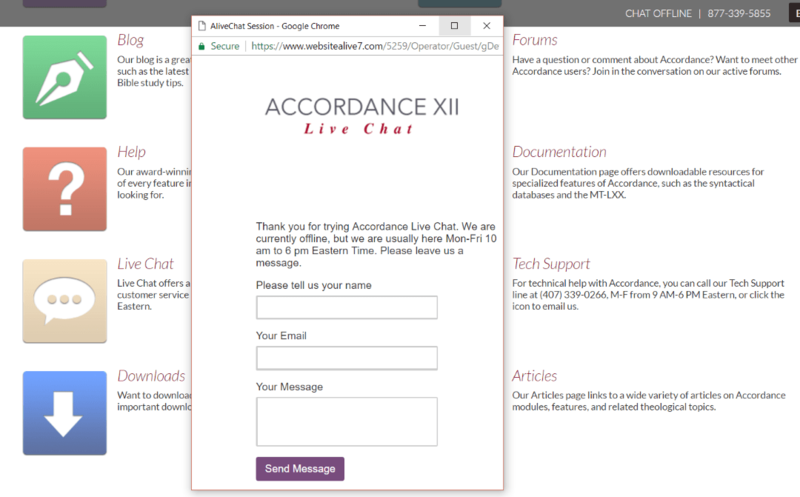 First we’ll take a look at what’s included and then we’ll look at the Accordance 12 layout and some of the new features. The Discoverer level is great for beginners because it provides what beginners need at the best price. It’s considered the best value at $399. It includes over $2200 worth of resources. The Learner level is a great place to get started at an affordable price. The English Track is best for those, like me, who mostly use translations. It includes Greek and Hebrew lexicons, but the main focus is on the Bible in English. It includes biblical studies, dictionaries, history, preaching helps, general tools, commentaries, theologies, lexicons, devotionals, books, and Bibles in both English and international languages. 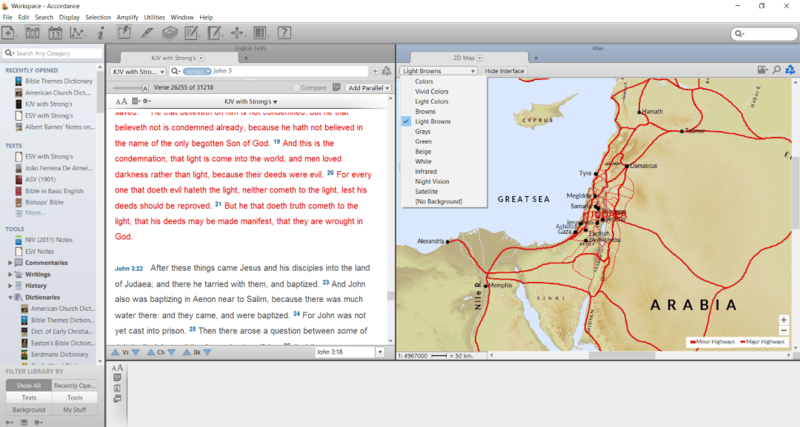 The Graphics Track is great for anyone that wants to use graphics, photos, charts, maps, timelines, and illustrations in their Bible study, writing, and presentations. It’s an add-on and doesn’t include the required Accordance 12 Starter package. The Graphics Learner covers chronology, environment, and geography. The add-on costs $99.90 and includes $300 worth of resources. This makes the edition I’m reviewing an affordable place to start for preachers and teachers as well as laymen. I think it’s suitable for anyone in any type of ministry. I really like the tools in this edition because I find them to be helpful for study and sermon prep. You can start here and then add to your collection by buying individual items as an add-on. If you want to just try Accordance then I recommend taking a look at the Lite version. This one’s free and includes the ESV, KJV, both tagged with Strong’s numbers, RVR 09, and the Hebrew and Greek lexicons, Easton’s Bible Dictionary, Matthew Henry’s Condensed Commentary, Nave’s Topical Bible, a few international Bibles, and some resources to help you learn to study the Bible. The Lite version will also run other packages so you can buy books to use with it. 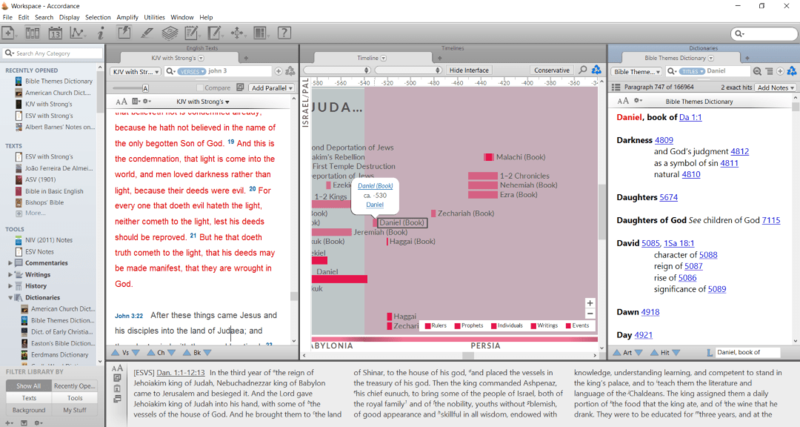 I highly recommend using the Lite version for basic Bible study if you don’t buy a premium collection. Installation was smooth. 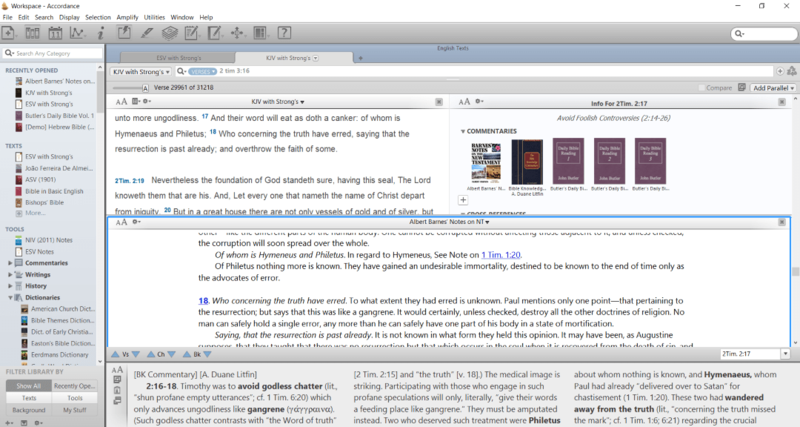 I had already installed the free edition of Accordance 12 and then ran the Easy Install utility to install the update. It found my upgrade and installed everything. It is a large download and took a few hours on my 4g connection, but it was a painless process. The first thing I noticed is the simplicity of the user interface. 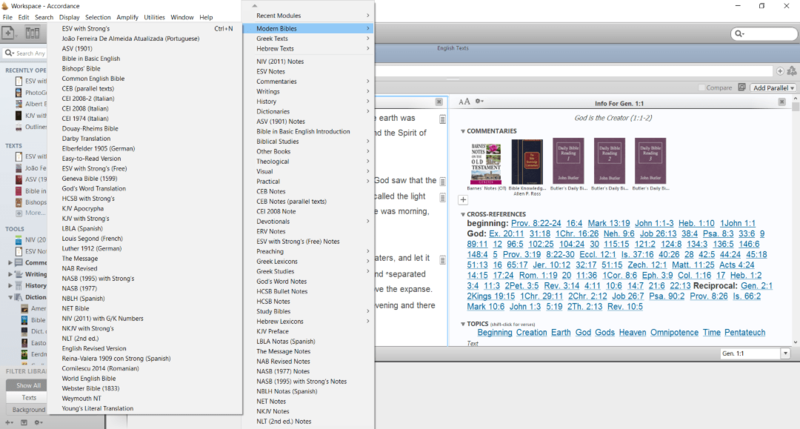 It’s much simpler than the other large Bible software packages that I’ve used. Where they look like AutoCAD or Photoshop and make me think I need a semester of college to get started (because they pretty much do), Accordance 12 looks simple and familiar, with menus that I’m used to seeing in common software design. Even the non-familiar icons are self-explanatory. Don’t let that simplicity fool you though – simple doesn’t mean not powerful. You can rearrange the layout any way you want. Just drag and drop windows, open and close resources, create new tabs, etc. Almost everything is just a click away. 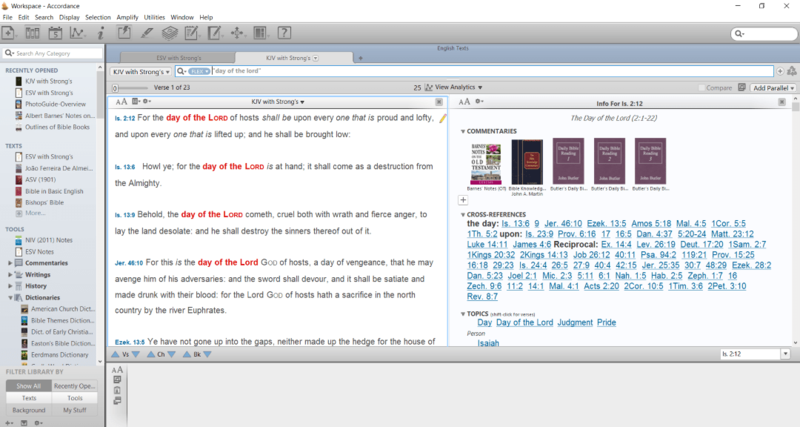 I like the layout in the image above with my library on the left, Bible to the right of the library, information pane to the right of that, commentary open under the Bible and information, and then the window on the far bottom (Instant Details) shows the information about what’s under the mouse cursor. As you scroll through the commentary the biblical text will scroll with it. All of this is fast and my system never seemed to slow down from using too many resources. Two of the most important of the new features are the Stack and the Paper. A stack is basically a collection of information that you’ve gathered. Any time you see something you want to have easy access to, such as an image (or a portion of an image) or quote, you can add it to your stack. You can sort them, star them, and even add your own comments. Sort by topic, type, date, or by favorite. The stack shows the header (title of the content), your comments, the citation, the source (which you can click to open), and the date and time you added the content to your stack. You can delete the entry, favorite it, or copy it. The background color of each entry will change to reflect the type of source it was copied from, which is great for knowing the type of resource something is at a glance. You can add a user item – a note that stands on its own. Save images, quotes, comments, and ideas to reuse any time you want. It retains all of this bibliographic information for each item so you can access it later. You can click on each item in the stack and open the original in a new window. The Stack is an excellent tool for writers, preachers, teachers, and students. 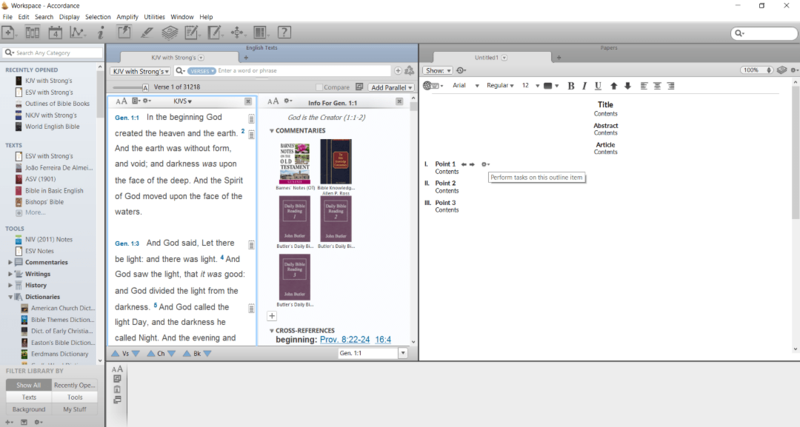 It’s great for creating sermons and articles. I love how it automatically creates proper citations. You can create a new stack under File, User Files. You can see your stacks in the library under My Stuff. There you can open them and modify them any way you want. 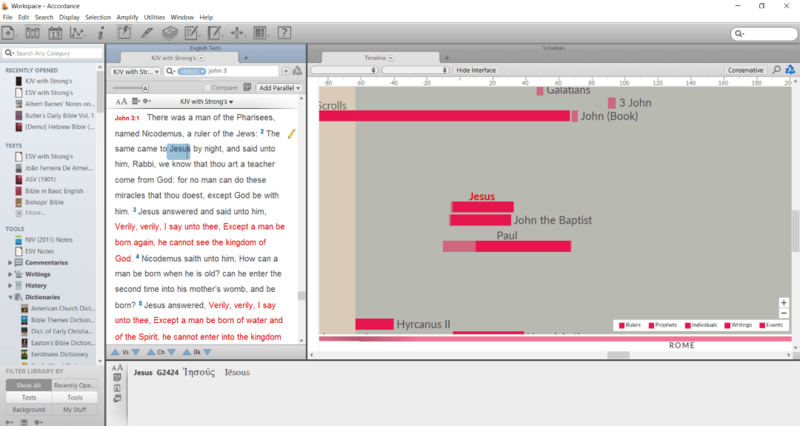 Paper is a word processor that allows you to write or outline sermons, lessons, articles, lectures, etc. Create your own papers from an outline or a blank page. It includes several templates for outlines and you can edit each of them and create your own custom templates. 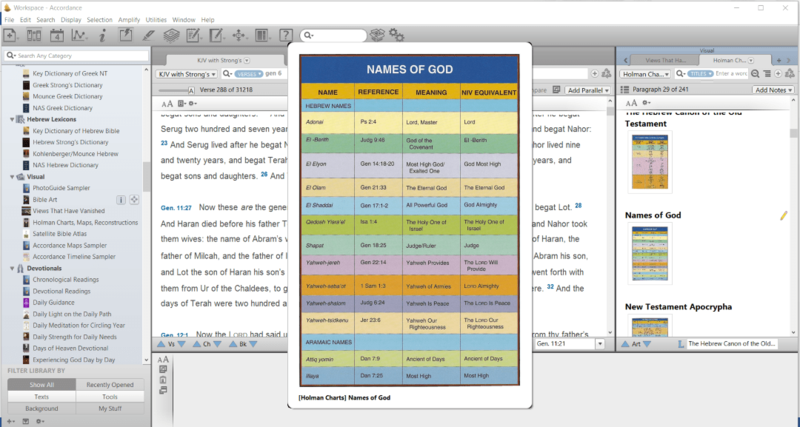 The templates are designed to help you create lessons and sermons based on a specific style. For example, you can develop a story-telling sermon, an inductive topical sermon, a practical sermon, a general sermon, a lecture, a lesson, or an article and have a head start by choosing the template. 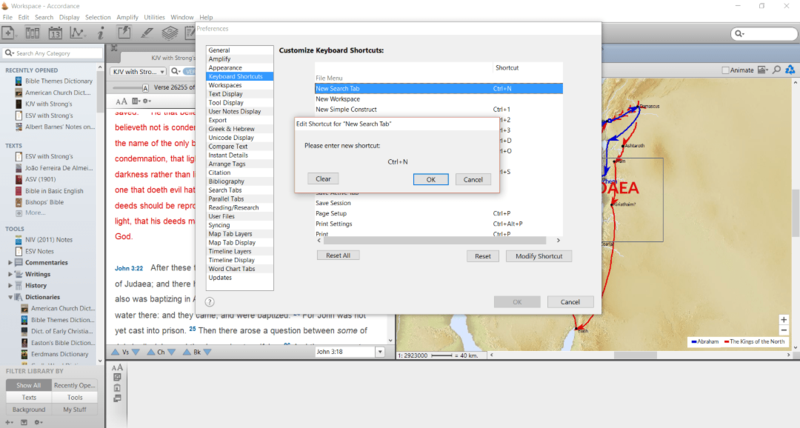 Easily add to or edit your papers and rearrange the content by dragging and dropping the sections, subordinating sections, promoting sections, etc. You can also choose which elements display, which is helpful if you want to hide a note or something that’s not fully developed yet. See and restore any version of the paper by viewing its history. I like that you can type a reference and it becomes a hyperlink. I’ve always liked the idea of references in my notes being clickable. One feature I found interesting is the ability to drag and drop items from your stack onto your paper. This is great for copying from commentaries to paste into your paper. 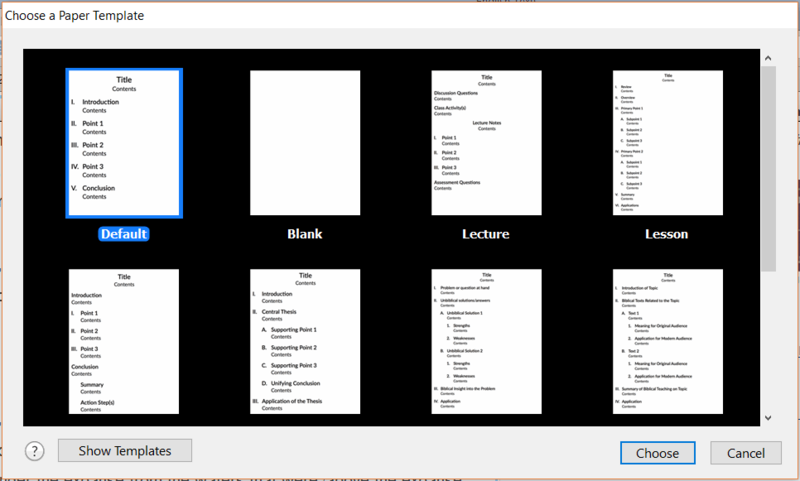 When you drag and drop items it automatically creates end notes and a bibliography. That’s a real time-saver because for writing you have to create that anyway. Even for sermons it’s helpful to have the information handy in case you want to give detailed information about where you got the quote, and for class lectures where students might ask for more information and you can point them in the right direction. I find it to be a satisfying word processor for writing. When you select a template it will open in a new window. From there you can choose what’s visible, see the history, zoom, open a stack, rename it, save it as a template, etc. You can also start editing the content by clicking on the item you want to edit. Another useful feature is the ability to choose the language between English, Hebrew, and Greek. This is great for quickly switching the language of your keyboard for writing. See and open your papers in the library under My Stuff. 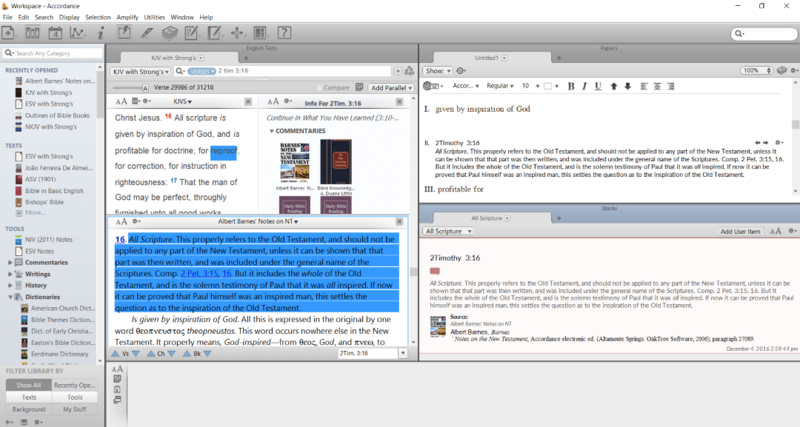 Being a writer and a pastor I found this to be one of the more interesting and useful features of Accordance 12. There are lots of improvements to the many tools that were available in older editions. Here’s a look at some of the improvements. The Info Pane has five new categories to improve your study. Those included in the edition I’m reviewing include word lists and study Bibles. Improvements in other collections include: grammars, manuscripts, and manuscripts images so you can view scans of the actual manuscripts. You can open and close the Info Pane with the toolbar button across the top. The first thing I noticed is how easy it is to see commentary or other tools for the passage you’re looking at. 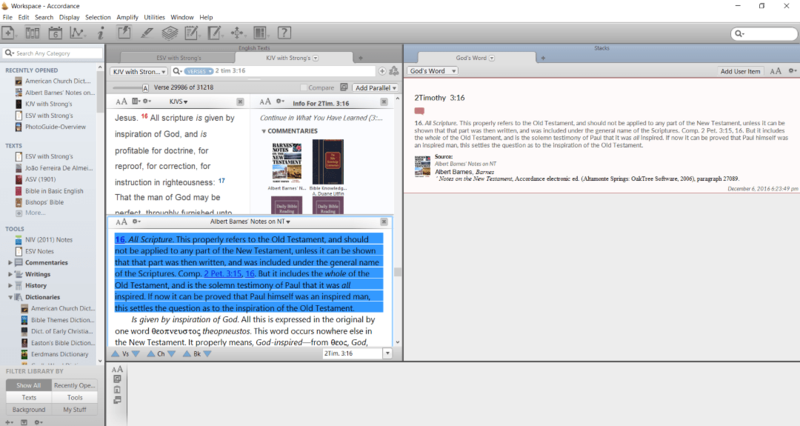 Typically the tools are on the right of the Bible text and refer to the verse at the top of the window. When you mouse over any of the commentaries their information will appear in the window at the bottom of the screen. 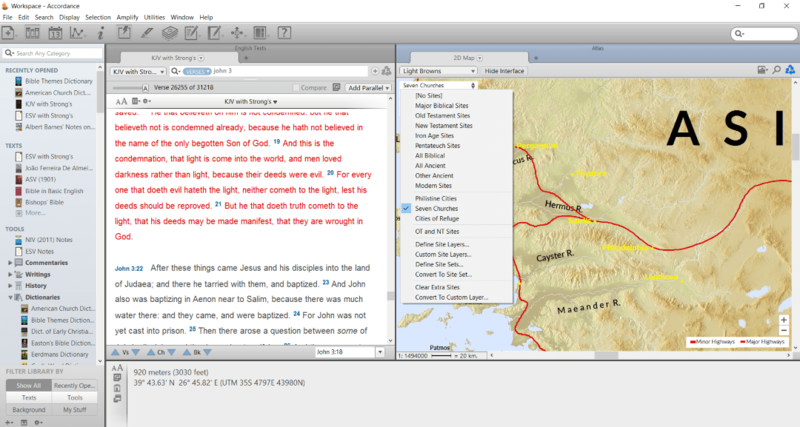 The Info Pane shows tools to help you study the text. What’s included will vary depending on which collection you own. Click on them to see their content in a new window and then you can scroll through it, add to your stack, etc. The first one is your commentaries. It displays the book covers. As you mouse over them their information related to the verse you’re reading is shown in the Instant Details box at the bottom of the screen. Click the plus button to show more commentaries or the minus button to show fewer commentaries. Next is cross references. 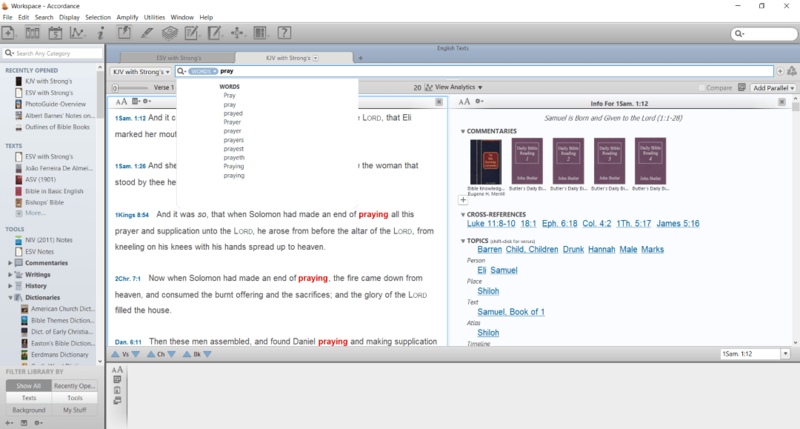 You can mouse over the references and the full verses appear in the Instant Details box. Next is a list of topics. You’ll see more information in the bottom window when you mouse over each topic. If you hold shift while clicking it will open a new tab with a list of Scriptures. There’s a new feature called Word List. This gives you a list of the words in the verse you’re looking at (the verse at the top of the window). Click on a word in the word list and see every verse where that word appears. At the top of the window is a button for analytics where you can see analytical information about the words. Sort the words by concentration (importance), count, alphabetical, and verse order, and view them by word or key number. The key number shows you the Strong’s number, the word in the original language, and the word in English. 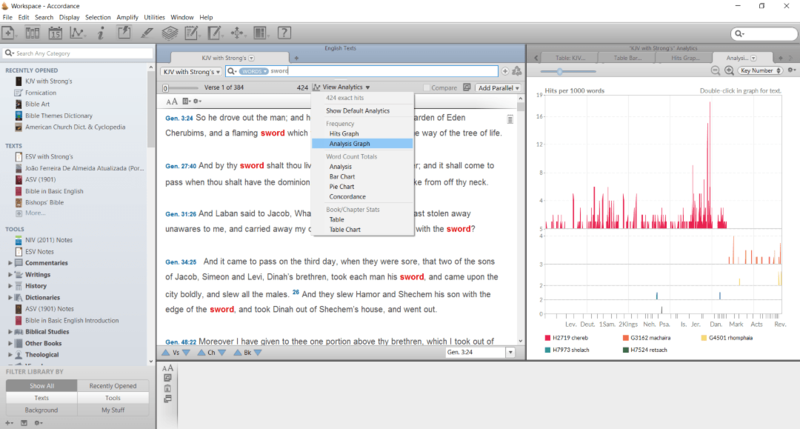 Study Bibles now have their own category, which makes them much easier to get to. These work the same as commentaries. Mouse over them to see the information they contain about your current verse. Click on them to open them in a new window. You can drag and drop these categories in any order you want. This is a great way to place those categories you use the most in the most accessible location. The timeline is an interesting tool. This time around it has a new color palette. Select a name and then select Timeline under Amplify in the menu. A timeline will appear in another window. Here you can zoom in or out and see how the person fits within the overall biblical timeline. 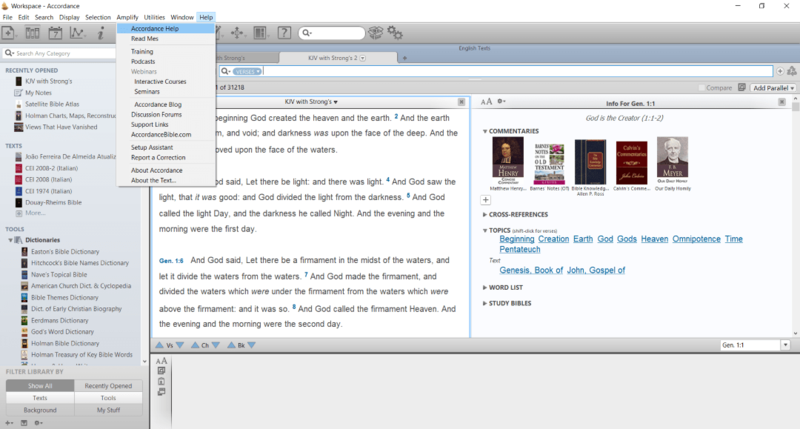 Mouse over a book of the Bible and you’ll get a snippet of that book at the bottom of the screen. Clicking the name opens information in a tool such as a dictionary. You can tie things to your timeline. When you double click on an item in the timeline it will open the resource that you’ve tied to it. There are lots of colorful maps included with the Graphics Learner collection. You can also select Amplify and see a location on a map. There are 13 different visuals for maps. Most show them in different color combinations. My favorite is Light Browns. You can switch between them by selecting the dropdown box on the map’s menu. Also from the menu you can choose sites, regions, routes, and layers. There are dozens of selections within the menus. You can also define your own layers. Information about the maps displays in the window at the bottom when you mouse over an area. The maps will even show routes in animation. You can view them by clicking the animate box in the upper right corner. View any area in 3D by selecting a portion of a map and then choose a highlighter magnification from the menu. From here you can move, turn, zoom, etc. to see a location from multiple views. There is a vast amount of content just in the maps alone. They show routes, borders, people, events, wars, sites, cities, water, distance, and lots more. They’re interactive. You can turn sections on or off and view elements that you want to see by selecting them from the dropdown boxes. Another feature that I found helpful is the ability to customize your own keyboard shortcuts (this is done in Preferences under Edit). You can make a shortcut for any Accordance action you want. This is great for tasks that you do a lot. I love that you can sync with mobile devices. Currently you can sync with iOS devices. This is done with iTunes using Bonjour. I have an Android tablet and phone, but this will be handy for those times that I’m out somewhere and need to access something in Accordance 12. I simply borrow my wife’s iPad or iPhone. I’d love to have Accordance on Android. It is in the works but it’s still in alpha, so there’s no release date in the near future. Eventually though, we will have Accordance on Android and that will be a happy day at my house! 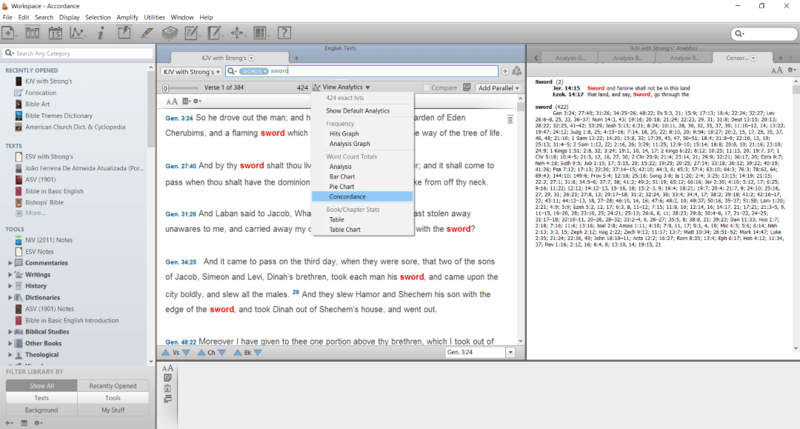 Accordance 12 has a lot of powerful search features. Even though it’s powerful I still find it easy and intuitive to use. You can search for Flex, Words, and Verses. You can also add search conditions to define the range of the search. You define where you want to search using the Range command in the search bar (shift + r). Flex finds all of the words and their variations within verses – in any order. I like this because if I’m searching for pray I still find prayed (which could have been what I wanted to begin with). You don’t have to type in exact words or phrases. You can still use an exact search if you want. Just add quotes around a word or phrase. Words finds the exact word or phrase. Verses takes you to a specific verse. It even uses abbreviations. This is an easy way to navigate the Bible. To go to Isaiah 9:6 just type isa 9:6, or isa 9 to get to the chapter. I did a search for day of the Lord. This found lots of verses with those words but I wanted the exact phrase. I placed day of the Lord in quotes and it only displayed those verses. What I like about this is I didn’t read anything that told me to do this. This is how I’m used to searching and it works. I prefer this to other Bible apps that you have to read the instructions just to do a simple search. Searching should be easy and intuitive and this one is. Tool searches let you search through all of the study tools in your library. You can even search by language, by verses, search images, etc. It gives you a magnifying glass to switch between a flex or exact search. 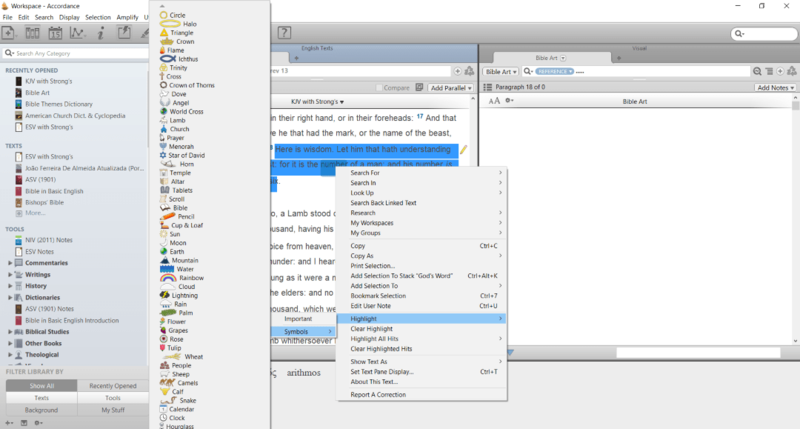 You can change the scope of the search between paragraphs and pages using ‘the page’. When typing words to search you’ll get a window with suggestions. You can select one of these to see the results. The search is super-fast. Type a word and hit enter and you’ll instantly see the list of verses with the word or words highlighted, and in the info pane you’ll see the list of resources that you can click on. It even shows you a history of your searches, making it easy to click on any of them again. Analytics lets you dig deeper into the search results. It has improved graphics, and interactive pie and bar charts. You can zoom and pan on the hits and analysis graphs. Pie and bar charts show instant details, and have clickable segments and mouse hover effects. Segments open a new chart. It will show filtered daughter searches in tagged texts and parallel sister searches in key number texts. You can also search for a word within a tagged text by holding shift while clicking on the word you want to search. It breaks analytics under several categories and shows the total number of exact hits, frequency (2 charts), word count totals (4 charts), and book/chapter stats (2 charts). To see analytics click on the button above the text in your search results. From here you can select the type of analytic you want to see from the dropdown menu. The image above shows an analysis graph. This one’s a bar chart that shows the words in the original languages with their Strong’s numbers and the number of hits. This one is concordance. I think it’s one of the most useful of the analytics tools. It shows every verse with the word you searched for. When you mouse over a reference the verse will appear in the window at the bottom of the screen. Analyze your research results across, between, and among texts. It has zoomable hits and analysis graphs, interactive charts, and clickable segments. You can even view the prior results. One of the analysis features that I thought was interesting is the ability to analyze combined search results. You can also compare the hit results between texts. This is an excellent way to do a comparative study. To use it open a new tab and select Research. Type in a word to search and hit enter. Open any of the tools or verses just by clicking on them in the Research tab. Select the analysis charts from the dropdown menu at the top of the window. You can group modules to create your own custom groups to search. This is done by using [Custom] in the research group selection menu. This helps make your research more targeted so you don’t have to sort through items you’re not interested in. It’s easy to use and I find it to be a helpful feature. This is a set of complex diagrams that show who’s related to whom. It will show information for many of the people within the diagrams. Mouse over the number next to a name to see the info. You can also search for people within the search box at the bottom of the diagram’s window. If you want to create a note it will automatically add the book names and topical heading as a header. There are lots of Bibles available. Click on the little + to open a new tab and you’ll get this popup. Select Modern Bibles to see what you have. Click on any of them to open in a new tab. Here’s a quick look at a few of the visuals that are included in the Graphics Learner package. 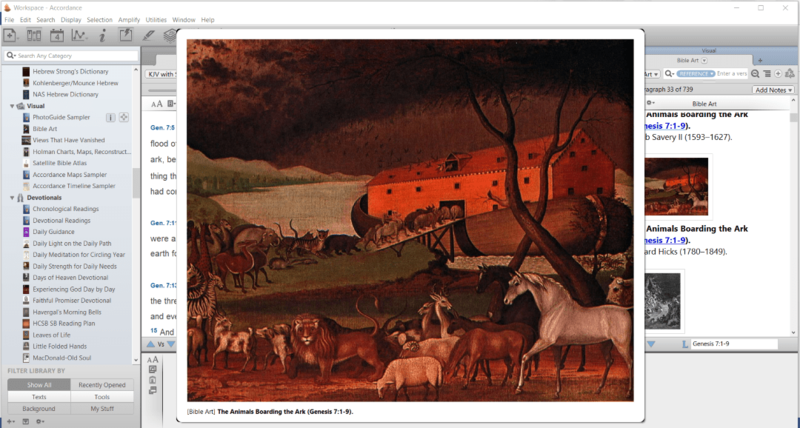 Bible Art has lots of high-res images of artwork that are tied to the biblical text. It shows the name of the artwork, the artists’ name, when they lived, and links to the Scriptures. You can copy, print, and add them to your stack. These are great for presentations and papers (or for looking at – which I do a lot). Views That Have Vanished is a book by Todd Bolen with photos from years gone by of the holy land and various locations in the Middle East. It includes lots of images and information that can be used in your materials. Each image includes a description and date the photo was taken. 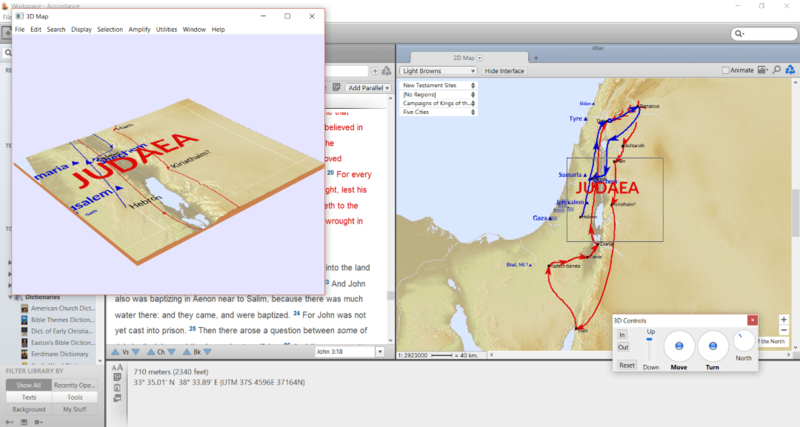 Holman Charts, Maps, and Reconstructions includes lots of charts and maps. Charts show lists of people, places, names, timelines, genealogy, items, and much more. The charts alone can give you tons of study and teaching material. They also include drawings of temples, places, houses, items, etc. 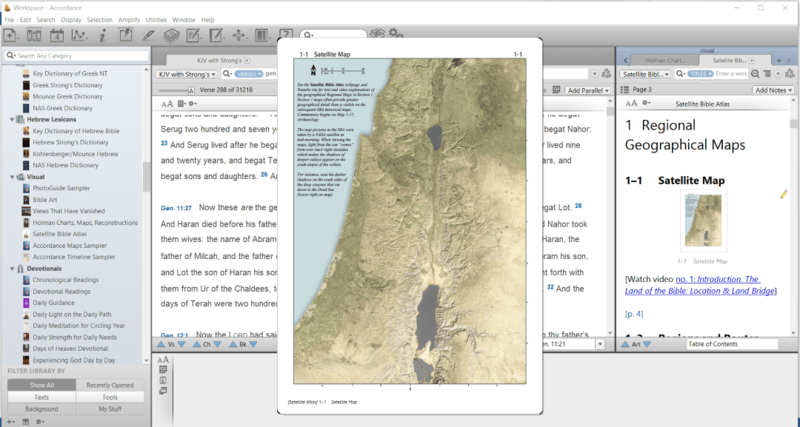 Satellite Bible Atlas covers the historical geography of the Bible and includes satellite photos with links to videos for more information. It includes descriptions and commentary where needed. They also include links to Scriptures. I’m a fan of Bible highlighting (that’s why I wrote a book about it). Highlighting is a great way to study a specific topic and apps are great for making highlights because they can be changed. 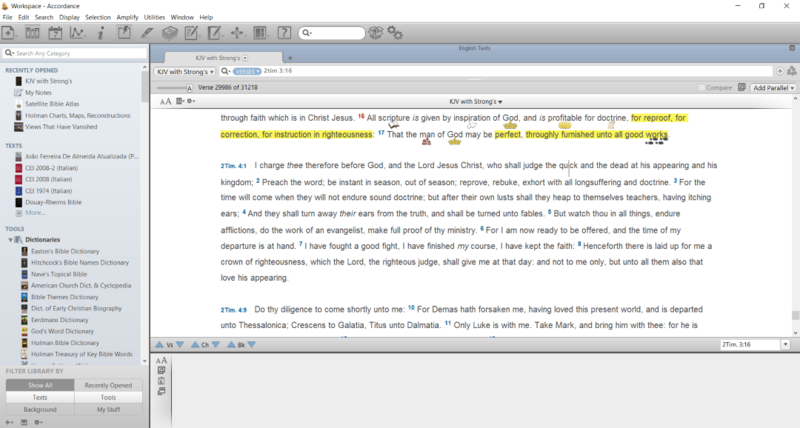 Accordance has the most extensive highlighting options that I’ve seen in any app and it’s easy to use. You can highlight with color and with symbols. Select the text you want to highlight, right click, place your mouse over Highlight, and then click Important or mouse over Symbols to see the list of symbols you can use. Select the one you want and you’re done. Every task that I did with Accordance 12 was fast. Many times I’ve done a search and waited for the screen to change to show me the results only to realize that it had already changed. 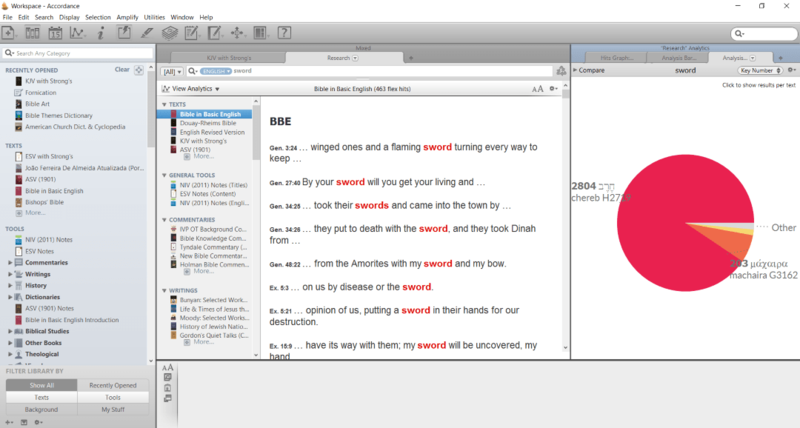 Accordance is the fastest Bible app that I’ve used. I’ve even left it running while running other apps and didn’t notice any load on the system. I’m highly impressed with its performance. OakTree (the makers of Accordance) provides lots of free videos for training on the Vimeo and YouTube platforms. I highly recommend subscribing to their channels and watching all of their videos. They also have podcasts, a blog, a training manual, help files, read me’s, webinars, and forums. These are accessible from Help in the menu. Support includes the help files mentioned above plus you can send an email, call, or live chat. I contacted support (as I usually do when reviewing software) and tech support was fast, knowledgeable, and professional. They stayed with me until the problem was solved (my laptop had gone to sleep during an update and Windows scattered the files into various folders). I was pleased with the level of tech support’s knowledge and professionalism. 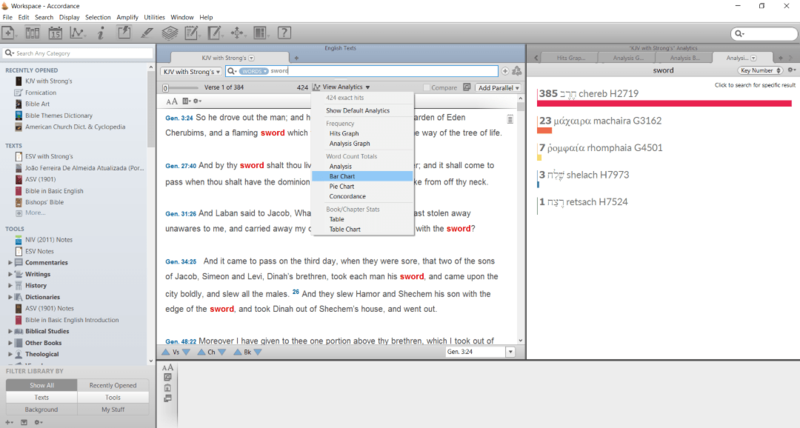 Accordance 12 has updates less often than other Bible apps that I use. The other apps update practically every day and some of their updates are massive downloads that can take a while and slow my system down. 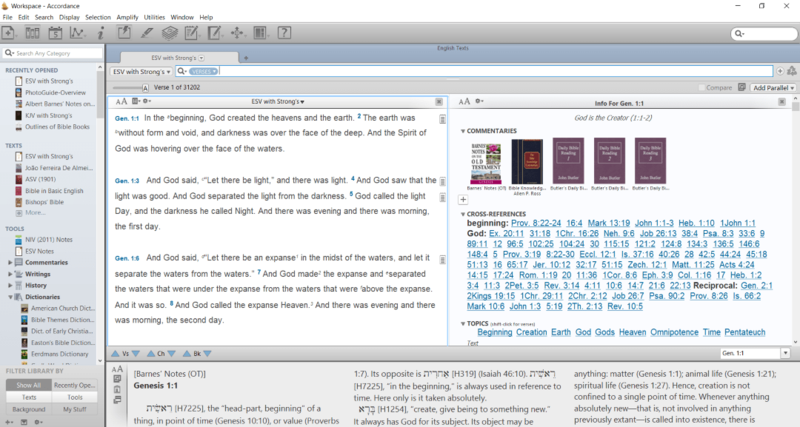 Accordance 12 updates once every two weeks or so and the updates are much faster. You can check for updates manually or set the schedule for it to check automatically. 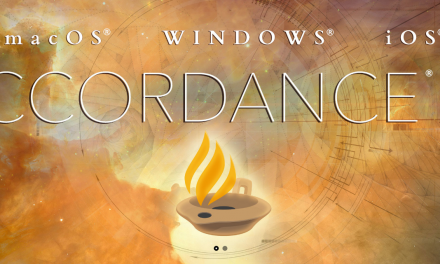 You can buy Accordance at the Accordance Store. If you’re upgrading you get credit for items you own. This means you get the library upgrades for lower prices because you’re not having to pay for the same items twice. There are lots of packages to choose from and you can buy in components to get exactly what you want. Prices start at $59.90 and go up to $29,999.00. The package I have is English Learner ($399) and Graphics Learner ($99.90), which together costs $498.90. Of course you can always get started with the free Lite version to see if you like the interface. It comes with a few Bibles and tools to get you started. 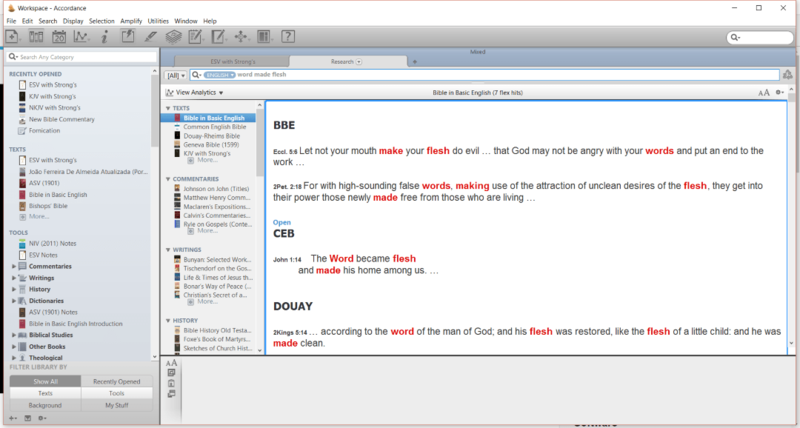 It has an impressive number of biblical texts and public domain tools including KJV, ESV, Strong’s dictionary, dictionaries, commentaries, lexicons, devotionals, cross references, and lots more. I’ve only scratched the surface of Accordance 12. It’s a large program and I still have a lot to learn, but it’s not hard to learn and I can do a lot of deep study and sermon prep without even looking at a manual. If I wanted to expand my knowledge of the app there are plenty of videos and help files at my fingertips. 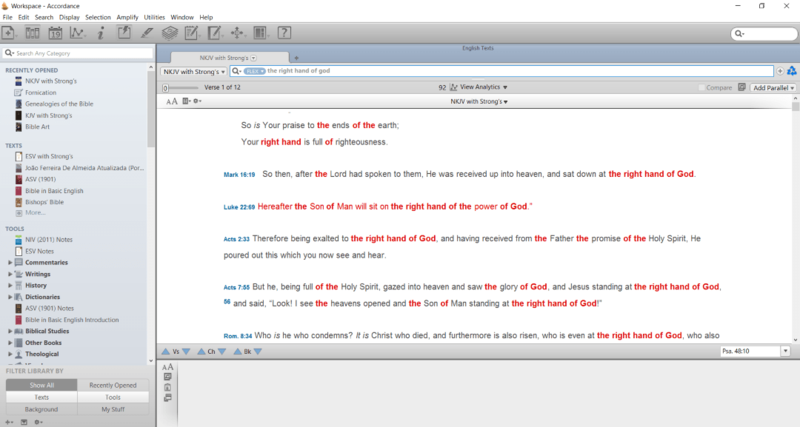 The interface is simple and intuitive enough that it didn’t take days of training before I could do basic Bible study. 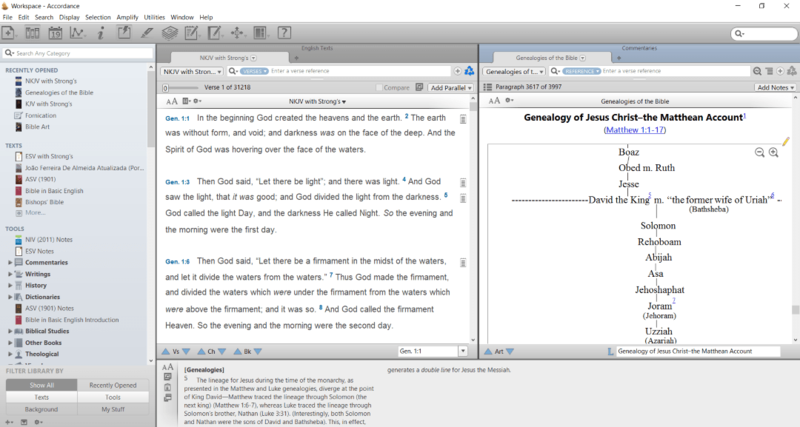 Accordance 12 is a power house of an app yet intuitive to use at the same time. 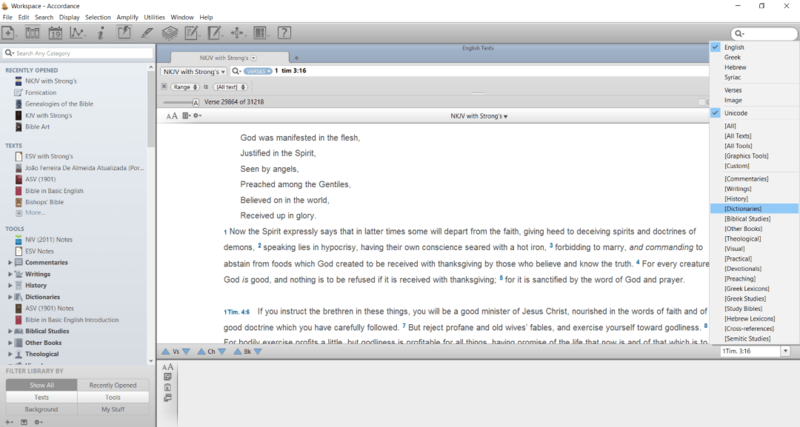 It’s a great app for Bible study, preparing sermons and class work, writing papers, and even casual reading. It has lots of tools and resources and it can expand it to suit your needs. I recommend Accordance 12 for anyone interested in a Bible app that’s both powerful and simple, and can easily grow with you. OakTree Software provided this Bible free for review. I was not required to give a positive review – only an honest review. My opinions are my own.